I have been trying to envision a bottle craft project for quite some time now and just need all the right things to fall into place so that it could come together. One of the first pendant lights that I made a few years ago involved a Bailey’s bottle and a salvaged cord from an old hanging lamp at a garage sale. “Nick took apart the base lamp so he could feed the wires through the bottle. 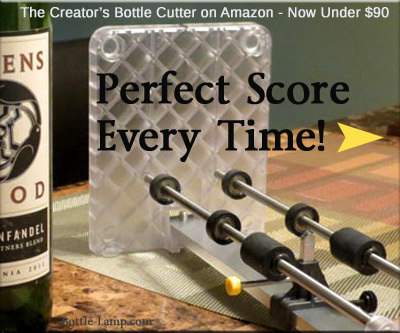 The next step was to drill a hole in the bottle cap and the Baileys bottle itself.” From the Baileys Bottle Pendant Light article we wrote back then. The problem – It seemed like a good idea at the time. 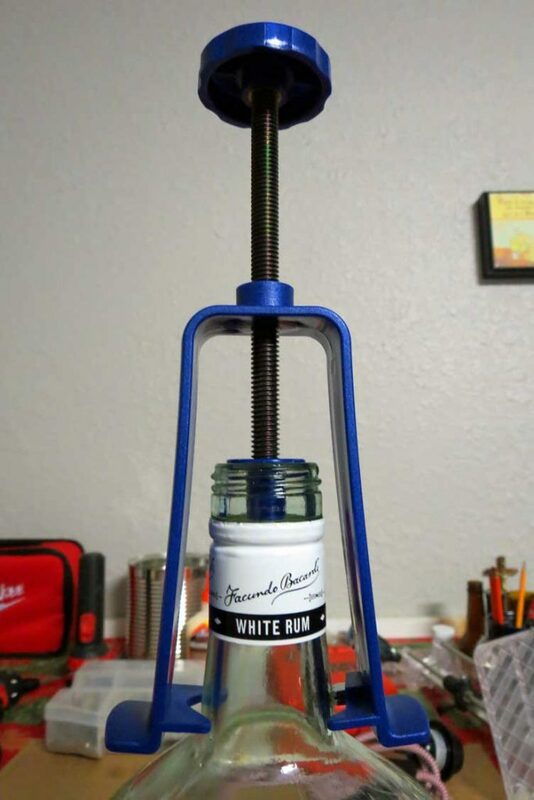 The finished product was functional and it looked pretty cool, but I actually drilled out the bottom of the bottle with a large glass cutting drill bit. It was a very lengthy process. 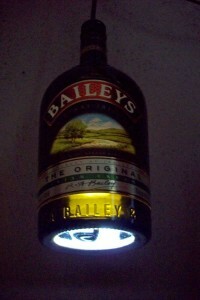 Incorporating the bottle’s original cap gave the light a more complete look. The hitch was that after it was on awhile, the bulb gave off a fair amount of heat, and the top got really warm. 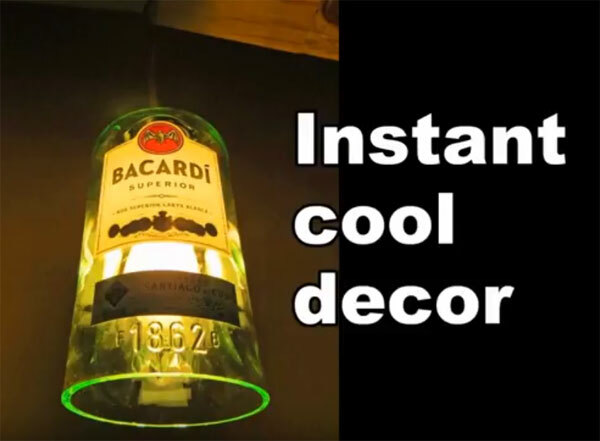 Today’s LED bulbs would fix that problem, but to be able to re-create this particular bottle light it would take all the same elements falling back into place. Mainly, the cord that I picked up at a garage sale and having to drill a very large hole. The solution – The Color Cord Company has the kit that would solve that problem! The ‘Standard Plug-In Pendant Light Cord Set‘ has all of the hardware that you will need to complete your pendant lamp. With over 35 colors and patterns to choose from you will easily be able to co-ordinate your glass bottle to a matching cord. Now that’s cool! Want to have the visual experience to help you with the pendant light making process? Color Cord Company is the industry leader in cloth covered electrical wire, pendant cord sets, and lighting accessories. Founded with design and DIY in mind, they strive to provide high quality products with the finest service and selection. The constantly design and create new high quality products and accessories. The Color Cord Company product range is ever growing and changing in order to offer the newest and most innovative lighting goods on the market. “Color Cord Company is the industry leader in cloth covered electrical wire, pendant cord sets, and lighting accessories. 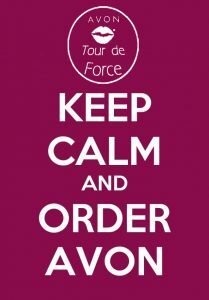 Founded with design and DIY in mind, we strive to provide high quality products with the finest service and selection. We do color. With an unmatched selection of cloth covered wire, lighting parts, and lighting accessories in up to 75 different colors there is no greater resource for modern lighting.” Courtesy of the Color Cord Company About Us page. For this bottle pendant light project I used the Standard Plug-In Pendant Light Cord Set – Red & White ZigZag. The red and white were a perfect match for the emblem on the large Bacardi bottle’s label. 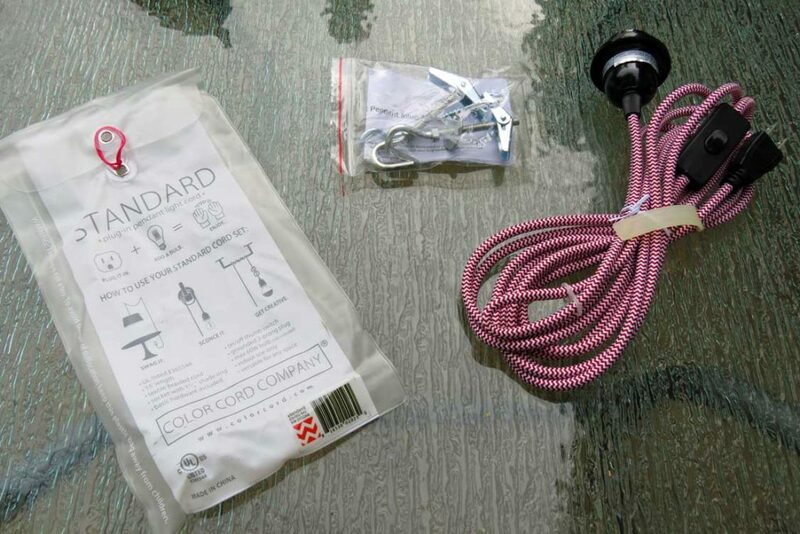 The easy to use Color Cord pendant light kit comes with a plug-in and switch already attached to the cord. Additional hanging hardware is also included. Two bottle cuts. By removing the neck and the base of the bottle I was able to feed the cord through the bottom and out the top. The bottle neck was too narrow for the plug-in and switch to fit through. 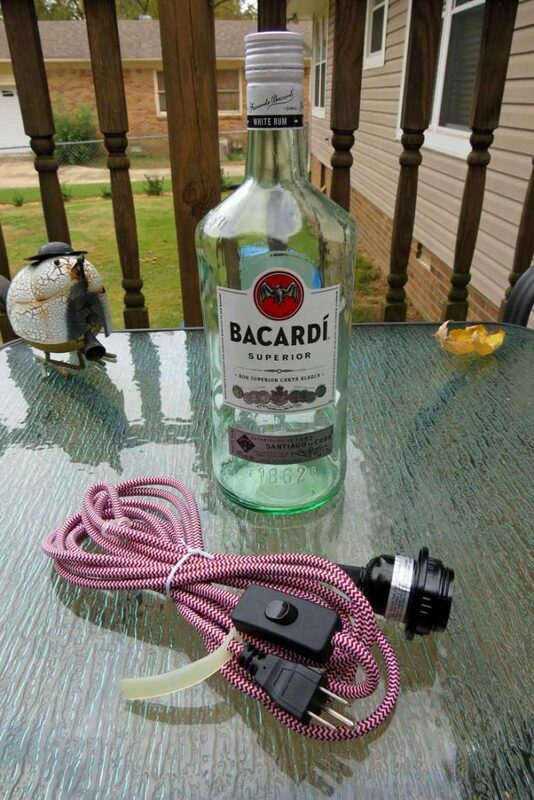 Scroll down to see the finished Bacardi pendant light. 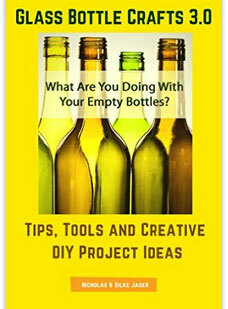 The tools that I used was a bottle cutter and the Creator’s Bottle Neck Cutter. You can find both glass cutters on our Resources page. End result – I was more than impressed with the way this all turned out. 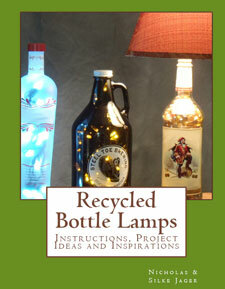 It was an easy and fun bottle project to put together thanks in large part to the pendant light kit. A colored glass bottle would be in order to tame the amount of light that was being emitted but finding a matching cord wouldn’t be a problem, with over 70 colors to choose from. The heavy duty colored cord that is constructed around the electrical wires offers an extra layer of protection without compromising on style. By the way, we will be including several of the colored pendant light kits by the Color Company in our 2017 Winter Giveaway! 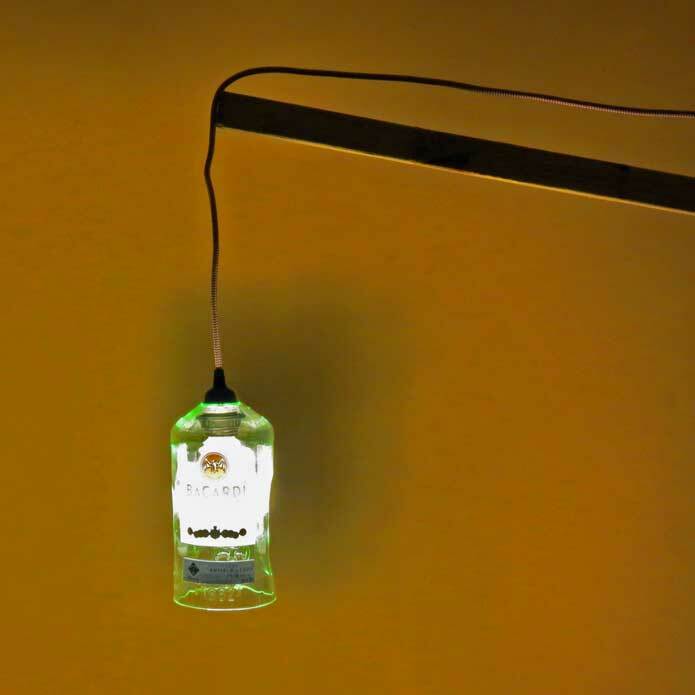 I think this Bacardi pendant light turned pretty nice. The pendant light kit couldn’t be easier to use and the different colored cord open a world of possibilities. If you have a comment or project idea you would like to share, please leave a comment below. I would have incorporated a pulley. The ones that used to hang out of old barn lofts. You would have added a real industrial feel to the whole thing. That’s a really good idea. I bet you could incorporate a few lead pipes to make the stand as well. I love the different colored cords. I wonder if they have a hot pink kit for my daughters room? With so many colors to choose from I really don’t think that will be a problem. FYI – Available ‘pink’ colors include; pink, neon pink, and hot pink. Cool, thank you Nick. I’ll go check it out.